There seems to be an excess of guardians in Hollywood these days, which should serve as a reminder not to confuse the animated Holiday-themed Rise of the Guardians with Zach Snyder’s gorgeous, but shallow, war-themed effort, Legend of the Guardians: The Owls of Ga’Hule. 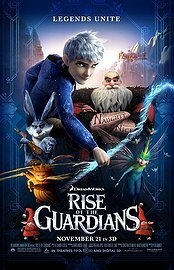 Another aid: although both dance to similar rhythms, it’s Rise of the Guardians that succeeds in delivering enough visual novelty and earnest characterizations to deliver a familiar hero’s journey with heart, humour, and surprisingly effective moments of threat and menace. The inventively realized lands of the films’ heroic guardians, at least those with lands to call home - Santa Claus, the Easter Bunny, and the Tooth Fairy – range from lush to surreal and benefit from an attention to detail that often inspires the sense of wonder so valued by the film’s characters. And the characters are conceived, designed and voiced with an elegant mix of whimsy and panache, a combination that elicits an immediately favourable visceral reaction. A biker-like Santa Claus voiced by Alec Baldwin with a Russian accent dual wielding sabers when not carving magical toys out of ice? Very cool, as is the diminutive and silent Sandman whose expressiveness is mediated via symbols that form in sand above his head. The bunny is funny, even with an inexplicable Australian accent, and the tooth fairy is appropriately sweet and lovely. The protagonist is literally as well as figuratively cool, an amnesic youth who is chosen by the Man in the Moon to become Jack Frost and, in dire times, to finally assume his place as a guardian of the world’s children. He is the sort of likeable chap whose innate nobility struggles to burst through the eclipsing effects of self-doubt and the nefarious influence of the film’s boogeyman (smoothly voiced by Jude Law) – think of Darth Vader’s attempt to seduce Luke to the Dark Side of the Force. It might be a (tempting) stretch to see in the film, which aggregates author/illustrator William Joyce’s Guardians of Childhood series into a single story, a celebratory fable of paganism pitted against the dark age fearfulness of Christianity. But wishful, and arguable, politics aside, the film is first and foremost a rousing celebration of those lovely universal sentiments so colourfully expressed through the pageantry of holidays. Rise of the Guardians is that wonderful treat, a film addressed to all ages, without condescension towards adults or treacly indulgences for the kids.